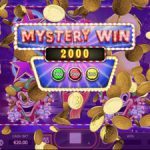 Once again we have all the traditional symbols but with a more modern makeover in the latest video slot game from Yggdrasil, Jokerizer. The symbols are placed on a see through reels and in the background we can see a theme park, just another implication that the fun is never over when you play this game. There is only one special symbol in this game, the scatter. It appears only on the second, third and the fourth reel and it activates all the features in this game. If you land 3 scatter symbols you will activate the Mystery Win which is a coin prize between 1000 and 6000. Then we have the Jokerizer Mode which you can play every time you land a win. 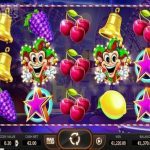 You can pick your winnings or you can continue playing by using the big Joker button. It will cost 20 coins to spin the reels and they will be taken from your win. The reason to play this mode is because the wins are higher and you can activate the Mystery Win with only 2 scatters. 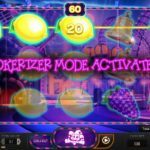 Jokerizer is a video slot game from Yggdrasil that you can play whenever you want. There are plenty of things that we appreciate in this game. The theme is the first thing that attracted us to give this game a chance. We have all the usual traditional symbols but with a more modern look and animations to start with. The game play is nice and the facts that there are features that are slightly different make the game play more challenging for us. For that reason we advise you to give this game a try because we believe that you will enjoy it the same way we did. For another great engaging slot you should consider playing Incinerator a 5 reel slot by Yggdrasil.